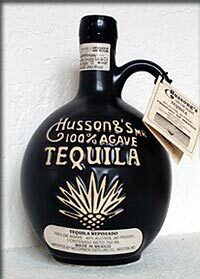 Hussong's Reposado Tequila was Created in 1892 by Juan Hussong. Each decorative ceramic jug of Hussong's tequila carries a registration number and a signature by Ricardo Hussong. Woo hoo! I don't know what it is about nightclub owners and famous musicians, but yet again we have a tequila associated with a famous (or perhaps infamous) nightspot: Hussong's Cantina. We're still trying to get Sammy Hagar's Cabo Wabo line of Tequilas, named after his club in Cabo San Lucas, so if you can help please let us know! Hussong's Reposado is a medium straw color. It has decent Agave flavor and prevalent wood tones, and a really nice burn on the finish. The 100% agave bottle of tequila pictured is apparently from Tequila El Viejito. It's easy to spot the Hussong's Tequila bottled in Missouri by the gap where the "100% Agave" tag should be. This might be because you can't bottle tequila outside Mexico and call it 100%. Without any designation (not even the sneaky, rule-bending 99% agave), I would avoid the non-mexican version purely on principle. Unless you're buying the drinks, of course, in which case: bottoms up!